After the Speaker started the Question Hour, Samajwadi Party (SP) and Trinamool Congress (TMC) members jumped in the well and started sloganeering. The Question Hour lasted barely for five minutes when Sumitra Mahajan adjourned the House. The proceedings of Lok Sabha were today adjourned for nearly 50 minutes during Question Hour amid slogan shouting by Samajwadi Party (SP) and Trinamool Congress (TMC) members over different issues. Immediately after the House paid obituary to former member of the House Kunji Lal, Dharmendra Yadav (SP), whose forehead was seen bandaged, raised the issue of lathicharge by Uttar Pradesh Police on SP workers in Prayagraj yesterday. "MPs are being beaten up. Police carried out lathicharge. Our leader (former Uttar Pradesh chief minister) Akhilesh Yadav was detained," he said. 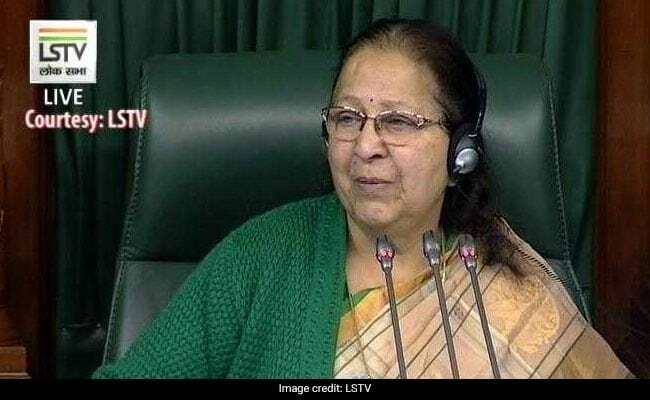 Lok Sabha Speaker Sumitra Mahajan asked him to raise the matter after Question Hour. After the Speaker started the Question Hour, SP and TMC members jumped in the well and started sloganeering. The Question Hour lasted barely for five minutes. The Speaker adjourned the House for nearly 50 minutes till noon when the slogan shouting continued.